If you have a school-aged child, there’s a good chance you’ve heard of UPlayDG. A 501(c)(3) program that teaches disc golf in schools across America, it’s currently expanding beyond the wildest dreams of founder and DD team member Zoe Andyke. Together with co-founder and DD player Dustin Keegan, they are ramping up their efforts in 2018 and hope to reach at least 10,000 students while they tour the nation and compete at the highest level our sport has to offer. You’ll be seeing the UPlayDG name come up time and time again this year, so we thought it’s only fair to give disc golf fans a history lesson about how this organization came to fruition. Like most great things in life, the foundation of the program started many years back during the formative years of both Andyke’s and Keegan’s disc golf careers. Although he didn’t discover disc golf until the age of 20, Dustin Keegan must have known that he was going to make an impact in the sport. Having learned disc golf from his friends and yet never throwing a disc until adulthood, despite growing up right next to Westmoreland DGC in West Eugene, he quickly grew to love the game. “I was playing ball golf three to four days a week for two to three years after high school. When I was shown the game of disc golf it just kinda clicked. It was like everything I love about ball golf plus the freedom of controlling an object instead of hitting it,” he said. Keegan’s skill set quickly paid off, as after playing in only five amateur tournaments, he won the Eugene Celebration in 2009. Eight years later he’s in his fifth year of touring and continues to rack up impressive finishes at each event he attends. It’s only logical that his passion for the sport would sooner or later translate into making a huge difference in the disc golf world. With much of a similar story, Zoe Andyke didn’t discover disc golf until adulthood. Starting to play in 2005, she said with a laugh, “I literally thought it was a secret backyard game that my friends made up.” A move to Bend, Oregon gave her the opportunity to begin playing competitively while she worked her day job as a physical education teacher. The chance to move to Alaska came up in 2009, where Andyke got to become even more immersed in all things outdoors, including disc golf. Just before leaving, she taught her first women’s clinic with an impressive 32 ladies in attendance and knew that teaching disc golf was in the cards at some point. Coming back to Oregon in 2011, she decided to go on tour in 2012 and quickly made a name for herself. As the 4 x Oregon State Champion from 2012 to 2016, she also got involved in numerous clubs in the state. Leveraging her teaching experience and becoming the “club pro,” she capitalized on the opportunity to spread disc golf to hundreds of people. Since they’re both Oregon natives, it makes sense that Zoe and Dustin would cross paths at a tournament or two. The two fondly recall the first time they met at the 2012 Pine Jam, where Zoe took home the win and Dustin ended in 6th place. At that time, Andyke was looking for a touring and training partner that she would get along with. Little did she know what was in store for the both of them! Keegan and Andyke began playing together casually, growing their friendship and eventually taking on doubles events as Team Oregon. 2013 saw them hit the road together as official touring partners, and it was during this time that the very first seeds of UPlayDG came to life. In an effort to support their tour, the two of them started hosting donation based disc golf clinics on Friday nights during every stop. With her natural ability to teach, this sparked a fire inside of Zoe to educate people about disc golf everywhere she went. “I told Dustin that this wasn’t enough. I had to get into schools,” she said. While taking the time to tour and grow their skills as professional touring disc golfers, the desire to teach disc golf in schools kept growing for Zoe. In 2015, she taught her disc golf curriculum, at that time termed a “disc golf camp,” to students at Lincoln Elementary in Corvallis, Oregon. The experience was overwhelmingly positive, except for an incident that showed Andyke the importance of safety during her program - a student hit her in the face with a disc, splitting open her upper lip, and creating quite a memorable experience. Later in 2015, a corporate wellness event with Intel in Hillsboro, Oregon truly gave Dustin and Zoe the foundation they needed to get UPlayDG up and running. With a focus on outdoor activity and blending the Father’s Day holiday into the mix, Intel contacted the pros to include a disc golf tournament with all proceeds going toward a good cause. The event was so successful that after a discussion with the Oregon Sports Authority, the money was used to begin funding what we now know as UPlayDG. Called Oregon Youth Disc Golf at that time, Zoe and Dustin now had a sustainable way to approach schools in the area and begin to educate children about disc golf. 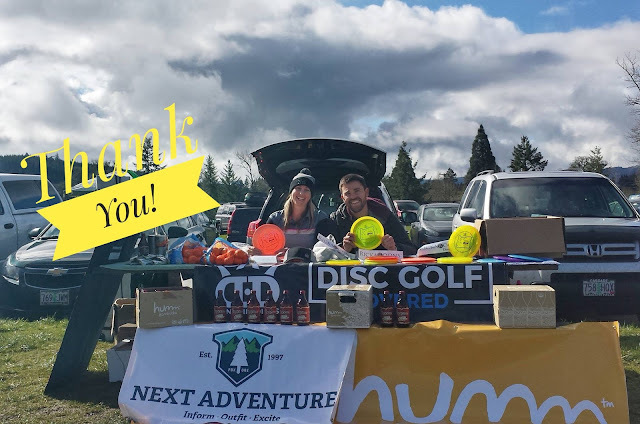 Tillamook High School in Tillamook, Oregon was the first official UPlayDG partner, as both Keegan and Andyke’s skills were tested to condense a nine-week disc golf curriculum into the span of one school week. Using this momentum, they contacted schools across the state and were able to reach nearly 7,000 students in 2017 while also touring. The passion for teaching disc golf couldn’t be more apparent on Zoe’s face as she recalled her experience at Tillamook: “I realized that I was on the brink of something way bigger than me and I realized where all of my childhood dreams came from. I knew what I was put on earth to do!” It’s with this determination to live out her dreams that she and Dustin are working to make UPlayDG bigger than ever in 2018. Operating as a non-profit often means countless hours of personal sacrifice to work toward a goal that is so near and dear to both of their hearts. If you’d like to donate to their cause, visit www.uplaydiscgolf.org. Curious how they teach disc golf to kids? Stay tuned for future blogs that detail how they successfully transform their passion into education across the nation. I love what you are both doing for disc golf and school children! Thank you! I would love to connect with one of you to see if you will be in the Dallas/Fort Worth area and potentially visit the school I work with. Thanks!